Cleaning Concrete: What Products Should You Use? Wouldn’t it be nice if your concrete driveway could always look as good as it did when it was installed? As careful as you are, stains and spills are bound to happen and ruin the appearance of your concrete surface. Luckily, there are many ways to remove stains and keep your concrete looking good. In fact, many concrete cleaning projects are things most property owners already have on hand. Below you’ll find a list of products commonly used to clean up fresh spills and set stains, along with instructions on what you should do prior to the cleaning. Depending on the size of the stain and how much of your concrete surface needs cleaning, you may not need everything on this list. If there is no excess liquid on the concrete surface and you’re just doing a standard cleaning, sweep the area of any loose debris before using the cleaning methods below. If there is standing liquid on your concrete (such as grease, oil, wine, etc.) pour cat litter over the liquid and allow it to soak up the excess liquid for about 30 minutes. If you don’t have cat litter, baking soda will also help to absorb the extra moisture. Once the liquid has been soaked up, and the litter or baking soda has been swept up and disposed of, then your concrete is ready to be cleaned. All of the methods below will require a scrub brush to remove a stain. Be sure NOT to use a metallic scrub brush because these brushes can leave behind metal bits that will rust and stain your concrete. Soda can be used to remove grease stains. It sounds crazy, but it’s true! This is because of three key ingredients found in soda. These three acids work to free the grease from concrete. Coke is a popular choice for this method, but any soda with these ingredients will work. Pour out the soda and let it sit on the concrete for 15-30 minutes. Depending on the size of the stain, you may use scrub brushes, towels or a mop to take care of the rest with cleaner and water. This is recommended for smaller grease spills. Some strong detergent paired with water, a scrub brush, a sponge, and some good old fashioned elbow grease should do the trick. Cleaning concrete with vinegar or baking soda is a good option if you are looking for a natural cleaner. 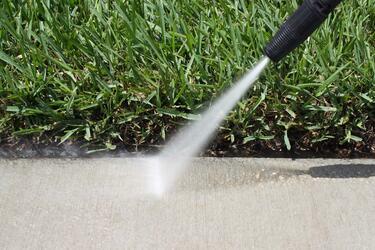 While cleaning concrete with bleach or detergent can be effective, it can also be toxic to plants. If you’re cleaning your concrete patio or sidewalk and you’re worried about nearby plant life, this is your solution! Simply fill a spray bottle with equal parts water and vinegar (or water and baking soda), and add a little bit of liquid dish detergent. Spray the mixture on your concrete surface and let it sit for about 30 minutes. Then scrub and rinse your concrete. Typically, concrete cleaners and degreasers are made from concentrated alkaline soap. These will loosen up the oil for easy cleanup. They do not, however, break down the oil so they will not work well on concrete that has been stained for a long time. This solution is most effective on porous concrete. Does a large area of your concrete need a good cleaning? Fill a bucket with warm water and about ¾ a cup of liquid bleach and start mopping. Let the bleach solution sit for a few minutes before using a bucket with clean water to mop up the bleach solution. It’s important to note that you should not mix bleach with other household cleaners and you should also be wearing gloves when scrubbing with bleach to protect your hands. Does Your Concrete Need More Than Just A Good Cleaning? A good cleaning can go a long way in improving the appearance of your concrete surface, but it can only do so much. If your concrete is in need of repair, consider calling the experts at Wolf Paving. You can get a free estimate today, or contact us for more information! Call us at 262-965-2121 for the Milwaukee area, or 608-249-7931 for the Madison area. With over 75 years of paving experience, from highways to driveways, we are your local source for all of your paving needs.